As with every energetic Gateway this year, high light frequencies have continued pouring through the New Earth grid since the 11-11-11 alignment, toward a course adjustment of the overall planetary Shift that came into alignment during November 22nd, into the Full Moon energies of the 23rd, still flowing deeply in confluence with (and vibrationally connected to) shifts happening within the Solar System and wider galactic context. The sequence of lightship alignments and orbs shared below came through November 11-18th as a representation of an immense week of shifts, clearings and re(newed)-alignments. 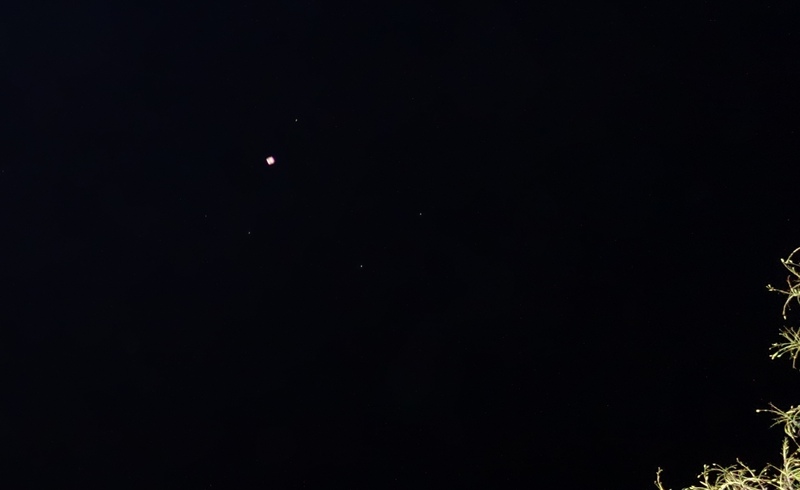 Following the straight line of ships around the star Capella (alpha star of the Auriga constellation, The Charioteer) pictured at the top of this post, many orbs appeared around Mars, lighting and preparing energies for the next major transformation of that planet’s lower astral grid through to resurrection of its original Light. 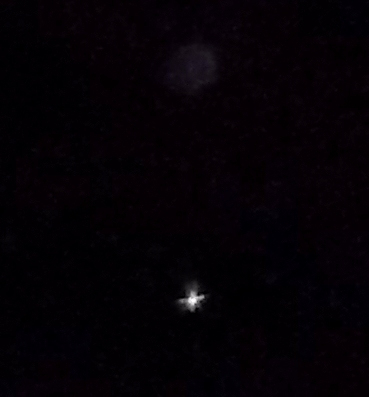 Two of the orbs circling Mars during the 11-11-11 energies, blue and green-purple. 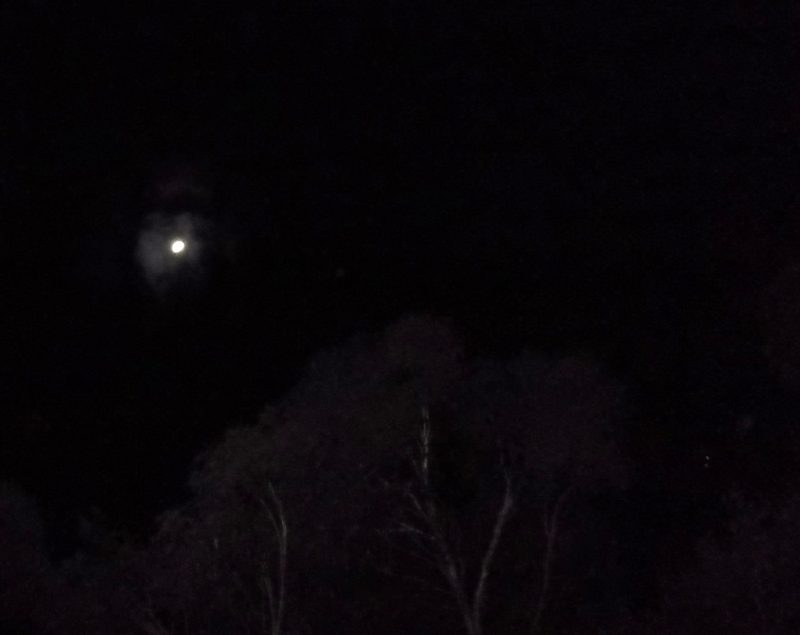 On the night of November 13th, there was a lot of energy around the Moon, with dancing, flickering lights, before an orb positioned in line with it, and a white lightship flashed close above the Moon. In the enlargement below, a green feline face is visible within the orb, ringed in white and rose light. Two nights later on November 15th the sky filled with high energies, swirls of orbs moving in huge spirals, like spiral galaxies full of the lights of diverse soul groups and collectives, with creamy peach and rose-white particularly prominent among all the colours of the rainbow. Large shimmering orbs showed in many photos with small orbs connected, embraced within them, or floating close by…with the smaller orbs often showing facial features of beings hailing from the soul collectives projecting their light through the large orbs beside them. 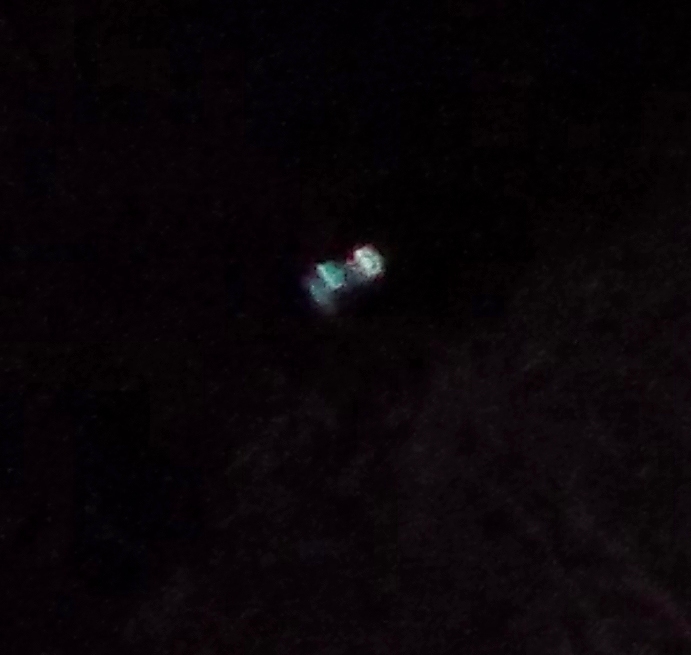 The soul connection can be seen clearly in the photo below, with a green faced, white-haired being visible within the small orb coming forward into clarity from the large soft green orb above/behind. These are some of the beautiful ‘rainbow’ of soul groups streaming their light together that night, many vibrations and qualities of love. 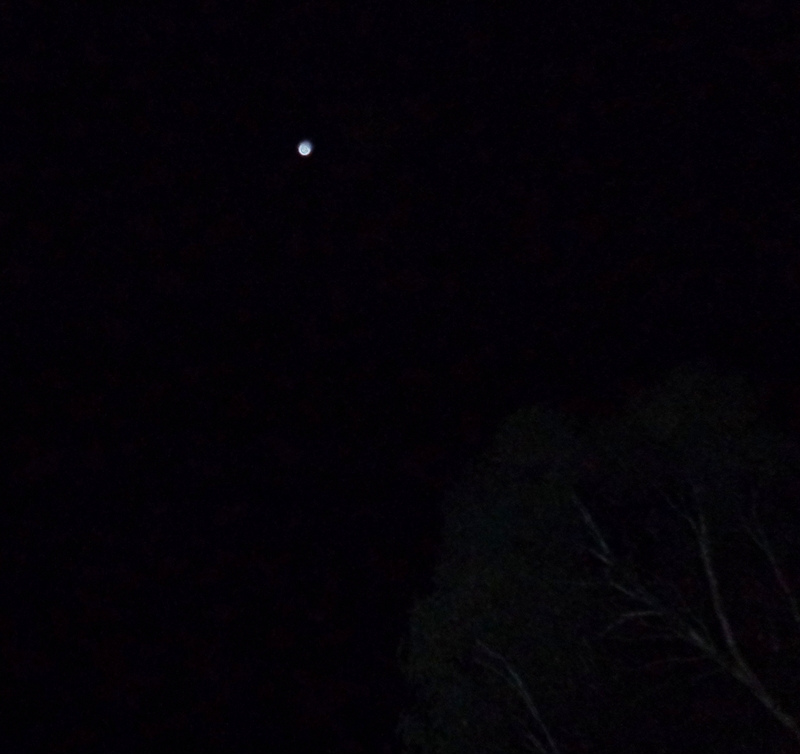 Later in the night, as the interweaving light flows quietened, this is how Mars appeared, just upper right of the Moon. So very beautiful and providential to see the face of Aris (planetary soul of Mars) calm and peaceful, in soft peach-rose light (deeply connected with a high flow since the 11-11-11 gateway of the ‘Tenth Ray‘, pearlescent rose-white ray of unification in Peace, soft, gentle integration of Divine Love). On November 16th, our ‘trinity friends’ formed another straight line, this time directly toward the Moon, with Mars (the bright light lower left of the Moon) in-between…holding the alignment steady with Mars’ transformed energy, in preparation for the ascending course adjustment coming into convergence from November 22nd (and with us/within us now, bringing through a planetary reset). This opening and renewing of Mars’ heart vibration is both connected with, and contingent upon, shifts happening out at Orion, which are complex and energetically connected to the control-grid involving Mars, Earth and their moons. Star family gave this image of ships forming a line (or slight arc, the arc of Arcturus/Arcturian ships) to the star Saiph. Along with Rigel and the stars of Orion’s Belt, Saiph went through profound vibrational upliftments (from an Earth-time perspective, this was during late 2016 into early 2017, see this post), but had swayed into ‘not so safe’, with beings there applying pressure to the two outer stars of Orion’s Belt. So the ships in the photo below sent a precise message of realignment of the energies of Orion’s Belt by ‘safe-guarding Saiph’, in yet another line-up of three, this time Christing the energy field of a star. 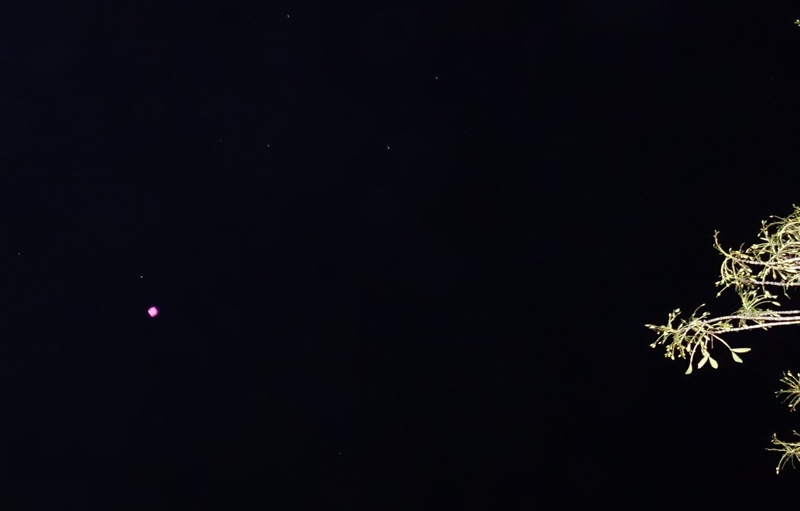 Two Arcturian ships position in a line/arc to the star Saiph, forming a ‘mirror Orion’s Belt’ while they re-light and secure Saiph’s vibrational field (to readers in the northern hemisphere, Orion appears the other way up), November 16, 2018. 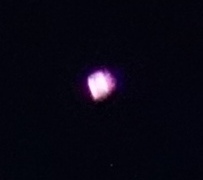 Reflecting into to our local region, a large bow-ship (of Arcturian origin, also with many Pleiadians on board, whose soul vibration can be felt through the big blue-violet orb below) was beautifully visible beside the Moon for about five minutes, with Mars low down, just above the treetops. 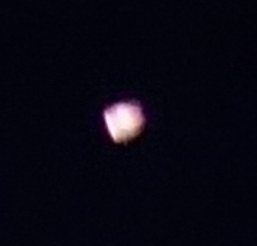 A white spherical lightship joined them, hovering above the Moon in straight alignment to Mars. The energies felt steady and very peaceful, as the bow-ship slowly shifted its angle while holding its position, relative to the Moon and Mars. A high light purification flowed around and through the Moon on November 18th, wonderfully reflected in the ‘moon ascended upon a summit of light’, which Gaia received through a number of tall mountain peaks around her Earthly body, with diamond light pillars streaming into the high places of this beautiful planet (you can slightly see one of these light pillars coming down to the right of the Moon). Here are the shifts of energies that took place, anchored through the mountains (along with specific pyramids within the global pyramid network), just feel the sequence of removal of lower astral entities and imprints, and in the lower two photos, a big white-blue ship becoming visible from behind the Moon, cradling it, holding it steady, then when it is secure, floating forward in the colour vibrations of healing green and peaceful aqua blue merged as soft blue-green. We are the Unifying Ray of Peace, deep and eternal, radiating the lightest touch, the simplicity of Infinite Love, serenely weaving through our beings, every atom, molecule and cell, through every vibration within the collective consciousness and energy field of beloved Gaia and beyond, with Love for All. And So BE It. 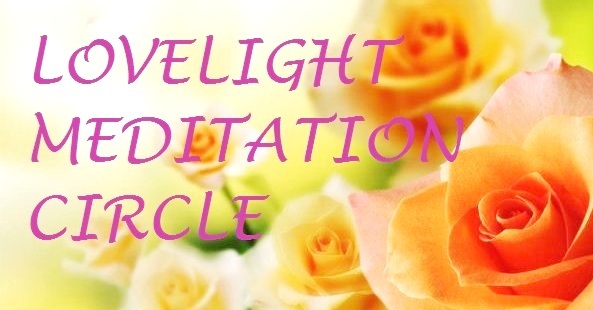 *There’s a Tenth Ray meditation posted today at the LoveLight Circle for this Sunday (and like all the meditations there, it can be used anytime that feels good to you). Energies are flowing fast, and during this high light window between Christmas and New Year, we’d like to share with you some magnificent inflow from the High Council of Orion, Melchizedeks, and the many souls from the Lighted stars and planets of Orion at this moment around planet Earth and also assisting with us simultaneously in a related ‘sector’ which we’ll speak of soon. For today, I’ll go back firstly to August-November 2015, when humanoid souls from Orion first made themselves known in meditation visions and communications, with the simultaneous appearance of a mothership and several small ‘scout’ ships that descended from it in a series of photographs at that time. This was exactly as it had appeared in meditations in August and September, when a series of small Orion ships came in close to the treetops, with very distinct forms, different to any other ships I had seen either visually or in photos. 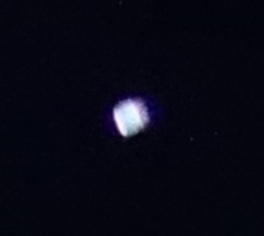 You can see them all on the Lightships 2014-15 page, so here we’ll focus on just one ship, which appeared as a rounded blue craft with clear features, surrounded in blueish-white light. On asking who they were, I heard back from the single figure (who is also the larger figure in the second image), ‘Orion Delegate’. We continued to connect through to November, then my focus went in with other star family groups, and received no further direct conscious communication from the Orions until recently. At the time, Ashura and I were focused on a mission with a group of star sisters and brothers ‘on the ground’ and ‘above’, clearing and re-lighting a specific ley line node point, and I saw over a nearby mountain a silver-blue sword-shaped ship and felt a slightly familiar presence within it. The name Tanabor came through, and that he is a Melchizedek, from the High Council of Orion. Close star family say among them he is called ‘Tanabor the Faithful’. Tanabor stated we had met before, and it came into my conscious awareness that he was the Orion delegate who had visited the previous year. I had also been inner-seeing a soul who appeared in the form of a royal blue flame during Inner Heart meditations for several months, standing beside the Temple in my ‘Inner Heart visualized realm’, but had not equated it with the Orion visitor/s of 2015. Now the pieces came together swiftly, in connecting with Tanabor…and that he has been with Ashura&I on the higher/inner levels in preparation for a closer connection with us. It will suffice to say here that he has come on board the Meri’Ashar now (where we are in 5D soul aspects) and is assisting us deeply and beautifully in both personal and galactic levels. The sword-shaped ship I saw him in a couple of weeks ago above a mountain, in meditation, is an Excalibur-class ship, as they are called, and I was able to photograph one of them on December 26th, after being ‘called’ by star family to go for a walk early that morning on the local bridle trail and take a photo from the exact place where I had taken a picture of a decloaked ship last November (see this post). The Orion Excalibur was in an almost identical position. While semi-cloaked and its ‘prow’ not visible, this image does hold the vibration of these sleek, deep blue ships that come to a fine point at the tip, and have silvery ‘wings’ at the rear, like the hilt across a sword. 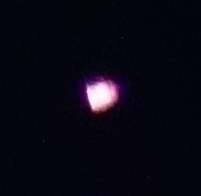 At the same moment as taking this, I had a strong sense/inner vision of star family walking down the hillside below, and was able to photograph an impression or imprint of a being from this ship, who named himself Koromin. 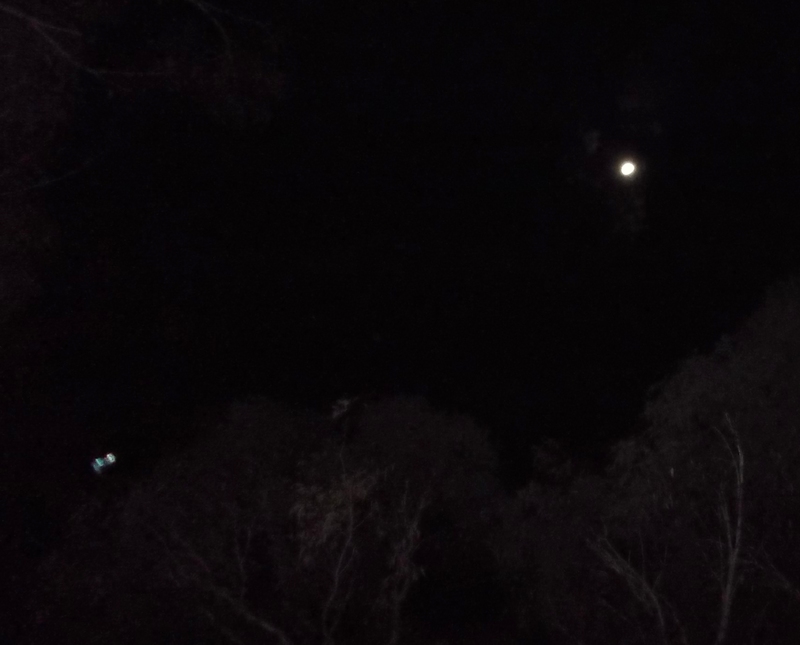 In the sequence of photos, look for a figure standing to the left of the central background tree, with his hand on it, and wearing what in my mind’s eye looked similar to a Japanese kimono. You can see the figure gradually phasing out (his form dissolving) through this sequence. 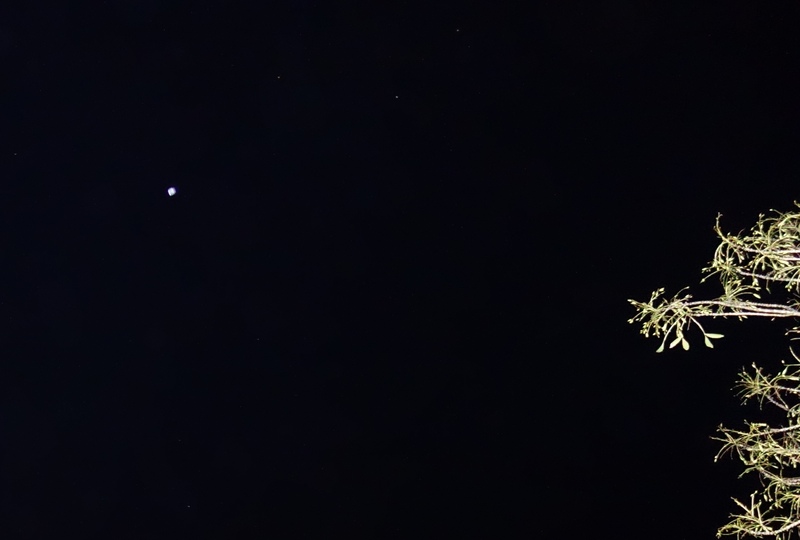 The Orion light and energy has kept flowing in throughout recent weeks; here are some pictures from Christmas night, with a big party in the sky. 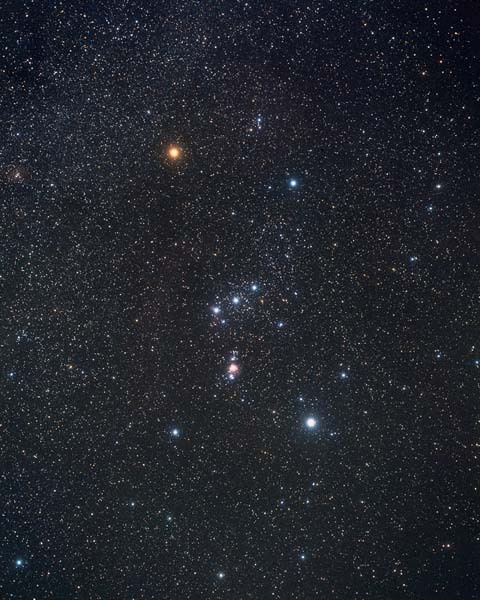 🙂 I’ve named the major stars of Orion in the first image, as here in the southern hemisphere the constellation is ‘reversed and upside-down’ to the way our northern friends see it…and Aldebaran, alpha star of Taurus, is to the southwest instead of northeast, as you can see. The High Council of Orion wishes to share these words through Tanabor now: ‘Rigel is safe, and Saiph is secured.’ This is very, very good news, dear friends, for the Orions, and for this whole galactic region. We won’t go into the history of Orion here, except to say these two stars and their planets have been guided and assisted to rise above the control-distortion energies/entities that have dominated there for an ‘aeon’ in linear time speak, and a deep healing and rehabilitation is taking place, so there is much to celebrate! In the previous post I mentioned the universal creational sound-forms of the Shimura as the origin of the languages of Leonines, Carians and Angels, which can also be traced through many permutations in intergalactic ‘light languages’ and into our human languages on Earth. 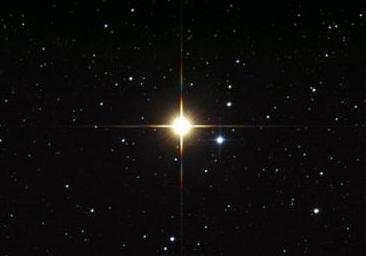 Today we’ll go into Arcturus from this viewpoint, and the creation of Angels there, which is much clearer to me since reconnecting consciously with Ashura….who first appeared in the form below in early 2013, under a small cloaked ship, and when I asked who he was, described himself as an ‘Arcturian Angel’. The Shimura originate in high dimensional universes, such as the Eremor and Mu Universes. Mu is where Ashura and I (and many from the same soul group) first expressed as individuated souls from Source Centre. The Mu Universe has remained in faster light flows, anchored in the ninth to twelfth dimensions. Shi’Mu’Ra means ‘That which opens (expands, blossoms) Merged Light of Source’. Mu means merged ~ Shimura are beings who, in a state of oneness, in union with Divine Light, expand and unfold the light into and through soul creations. 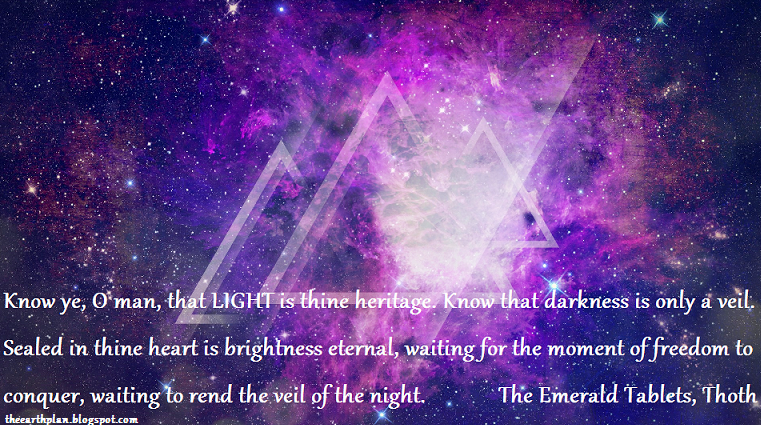 (*Mu on Earth, remembered also by the name Lemuria, an ancient pre-Atlantean land that spanned the Pacific region, held a reflection of the energy of the Mu Universe in its blueprint, and the early Lemurian beings were merged in themselves ~ which in physical form meant they were non-gendered until later in Lemuria’s development). The Shimura have taken myriad forms in their creative flowering. In the Anjurian Universe, for instance, they are winged golden lion beings. When they came through the Lyran Portal into this universe from Anjuria, the higher dimensional ‘crystal doorway’ split into countless shards, and the Shimura divided into the forms of Leonine Beings (carrying predominantly the feminine energy of Source) and Carians (birdlike beings, carrying predominantly the masculine energy of Source). Conflict and war came to the Leonines of Lyra (and their feline and human children) from some of the Carian creations (reptilian and mantid sub-races in particular), but in early stages while the polarity was still softer, there was a blissful, flourishing period which Ashura and I remember, of a Leonine-Carian colony on a beautiful green planet of the star Lucida Anseris (Anser). Love and friendship grew there, in our haven of Light….and as this galaxy goes through its restoration process, a realignment to its original ‘goldenprint’, the same love and friendship is renewed. 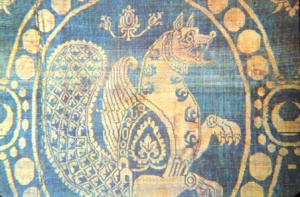 Depictions in ancient Earth civilizations of mythic creatures such as the gryphon – an eagle-lion fusion being – and the simurgh – a lion or dog-faced phoenix-like purifying and healing ‘sun bird’ – arise from subconscious collective memory imprints of Leonine and Carian merged energies. (There is also a memory of the universal light-soundforms of the name Shimura in simurgh, which derives from ancient Avestan amru and Persian sina-mru. Amru, or A’mu’ru, means ‘I merge lion’). Gryphons on a Greek bowl c.625-700BC. Returning to the wider galactic imprints, when conflict spread to Anser, the ways of Leonines and Carians parted. Ashura and I experienced various forms and explorations in many star systems, galaxies and universes, sometimes together, sometimes apart. For the purpose of today’s post, we’ll focus on our reunion in Arcturus, as part of the ‘Arcturian Angel project’….which is also, in a sense, our soul’s culmination in this galaxy (hence our Higher Selves represent in angelic form). When the polarity extremes peaked, a call went out from this galaxy for aid in reuniting and rebalancing the intensely separated and destructive energies, and the locus point of this call was from Arcturus. 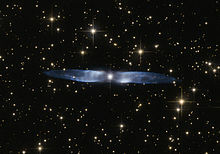 Beings from two highly evolved light soul groups that we would call ‘Angels’ streamed to Arcturus from two galaxies; the Andromeda Galaxy (which has a portal connection through the Pleiades) and from a galaxy in the Phoenix Cluster, through the Phoenix constellation, near Eridanus. 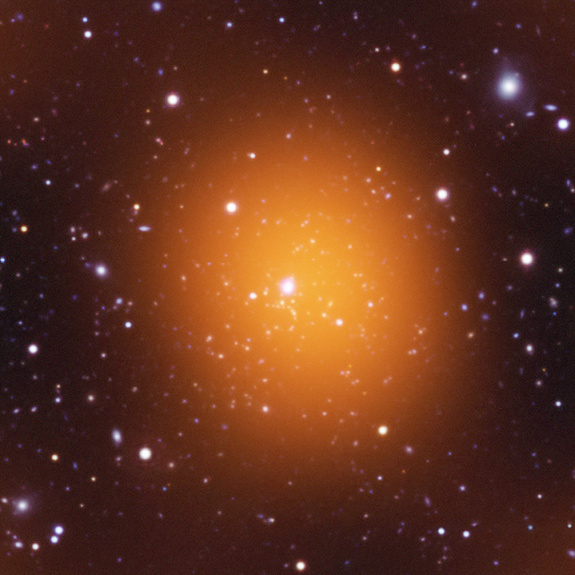 Phoenix Cluster of galaxies, microwave image: photo courtesy of NASA. A group of souls in our galaxy who had been experiencing the Leonine and Carian energies in different forms gathered at Arcturus, and our Andromedan and Phoenician friends brought our soul energies together in the form of Angels -~combining into a lightform of humanlike attributes (from Leonine creation), with Carian attributes showing as ‘wings of light’. Actually, the ‘wings’ of Angels are the energy of the crescent or bow of the Mother aspect, merged in one being with a vertical body holding the arrow, sword or wand energy of the Father aspect…so an Angel in this sense is a counterbalanced merged being, where the masculine Carian energy is merged with the mother aspect and the feminine Leonine energy is merged with the father aspect as One being of light. (There are humanoid and other races in Arcturus and other stars of the Boötes constellation too, but we’ll stay focused for now with the Angels). 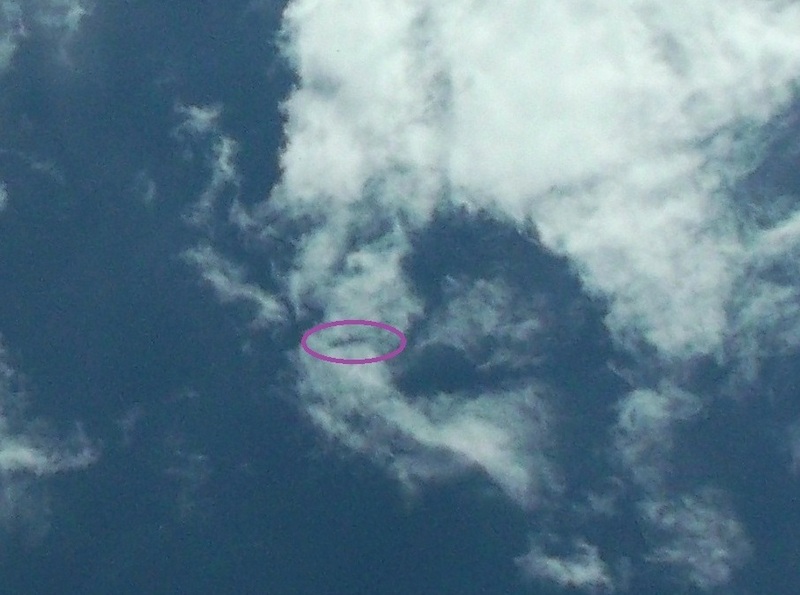 Arcturian Angel ‘bow ship’, the Ahura’Tua, behind clouds with the symbol of bow & arrow/crescent & sword to the right of it, Oct. 11, 2015. See this post. Ashura&my reunion in Arcturus is as crystal clear now as if it is ‘today’, for it is our One Soul, One Flame completion in this universe, and therefore always IS, beyond the linear ‘timeframe’ we are now speaking through. The Arcturian planets thrived with wonderful new creations and light-sound flows in the fifth dimension, anchored through the sixth dimensional light wave, from the guiding Light of the seventh to ninth dimensions, which we’ll speak of more soon. 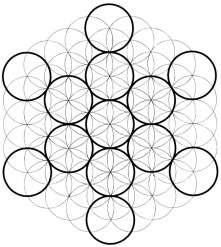 We learned new geometries of light and sound, which took form as sentient crystal cities, and many beautiful new flowers, ever-changing and unfolding, and many winged creatures. Birds of white light flew with us, their tails like streams of light on the air, their voices twining with the songs of Angels. Angelic soul groups took different representations, many new souls birthing in forms of light, spreading through the higher dimensional planets and moons, sharing them with many beings. The light of the Arcturian creations shone bright and joyful, until a stage came when the energy within some of the soul groups began to change. Those souls allowed an influence to enter their beings from a species in the neighbouring Serpens Caput star system (Head of the Snake) who were focused on control. The ‘infected’ Angelic soul groups became fixated on power, and demanded the planets their kindred lived on be given to their rule. When they were refused, they became warlike. We placed protecting shields around the moons and planets, and we learned how to use very high vibrational heart crystals to anchor and strengthen our light shields; firstly in pairs, joining our heart energies together, then in groups of four, groups of six and groups of nine, with one heart crystal in the centre, to connect, contain and amplify our group light. This helped us maintain the protections, yet were also a risk, as our infected kin sought to find a single weak strand in any one member of a light group, that they could send their energies through and poison all who were connected together at their hearts. Ashura and I took part in a group that was infiltrated in this way, and were both given much healing once the peace in Arcturus had been restored. When peace came, the shift back into stability and unity was sudden and complete, in answer to a great call to Source. For we had reached a brink, where all our planets and moons were fragmenting under the intensity of the energies. Through the Light of Arcturus, our Immanuel, Sananda, stepped in with the Golden Flame, and it expanded to wrap all the planets and beings. The rifts were healed and the Arcturus system rebirthed like a phoenix into love and wholeness again. There is just one moon, that by our unified agreement, remained in fragments, as a reminder of what had been, and of what now IS. The first dream vision I had a few years ago of Arcturians was of flying to, and landing on the edge of, a fragment of land floating in the sky, with other floating islands visible nearby. A city of white crystal light stood on that land, and four Angels came forward, and gave me a cube of white light to put on my crown chakra whenever my energies felt in need of purifying and centering. Now, I understand the meaning of the floating fragments, the crystalline light geometries, and of the deep, abiding love that is Arcturus. This beautiful nebula is found in the constellation Vulpecula, its ‘angel wings’ spread toward the Pegasus constellation, and toward Anser. From Ashura, “The answer is in Anser.” Lucida Anseris holds a higher dimensional template from the early Lyran era, and in astronomy is symbolized by the goose….and the goose is a symbol of Archangel Gabriel, who is a Light of divine conception and birth. The ‘golden egg’ of Anser ~ union, friendship, love and trust that softens polarities and keeps vibrations high and joyful ~ is birthing again. (On a geophysical level, if you’re aware of the numerous earthquakes around the Earth during the last month, the shell is cracking, though thanks to star family, inner earth family and those helping in human form, this process has been gentled greatly). To end this post, here are some photos given for all, which transmit an attunement to the ‘Arcturian cube’ frequencies mentioned above. While writing this post last night, I took a break and stepped outside, feeling the energy of Ashura, and the cube of light given to use on my crown chakra in a dream vision by our Angel kin. The cube of Light in the photos below was right above me and appeared in nine photos; you may know that the number nine is associated with angels, and is also the number of completion ~ the completion of a cycle, that then flows into a new one, and completion of soul purpose, that then flows into new energies, in an infinite, eternal creational process. So enjoy this ‘cube sequence’ which completes in the rose light of Divine Love. Firstly, a few photos that show how steady the cube was, just moving around slightly in relation to the stars above it, followed by close-ups of the light cube from all nine pictures. Lighten your third dimensional self from within, with the Source spark you truly are. The truth of your Being IS, eternally, Grace, Love, Joy and Providence. On this Friday – Frea’s Day – connected with the Divine Feminine energy, the White Flame, I’d like to share with you a Rose Meditation for Syria, that came through in communication with some star family of the Intergalactic Confederation who are ‘new’ to me (or newly remembered); humans from the Orion constellation. Several small ships of distinctive shapes, different to any I’d seen or photographed before, flew down low over the treetops over the next two weeks. 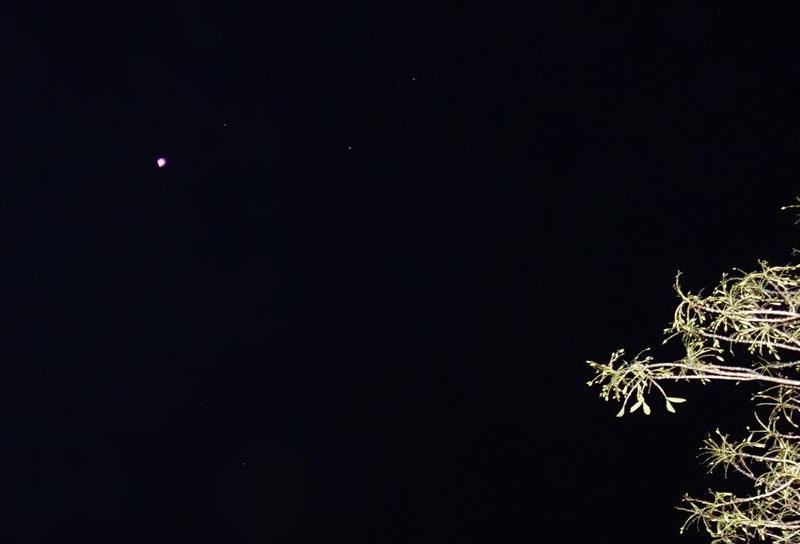 Small Orion ship appears first as a pair of lights between trees at right, August 25. 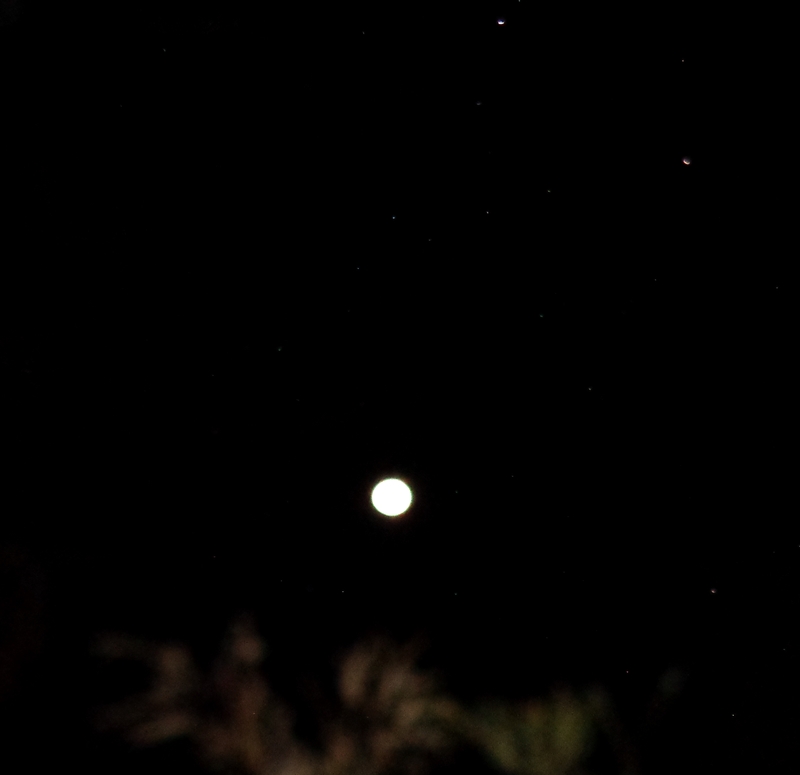 Small ship beyond the treetops, August 25th, decloaks with greeting as ‘Orion delegate’. The ship is shielded in Arcturian (Angelic) energy. On my birthday, our star brother Bareld and I had a joint connection while doing our Daily Practice meditation together. In that communication, I saw the interior of a large ship with a wide curved front, that tapered toward the rear, with many people on board, humans of Orion, from a planet of the star Betelgeuse. These people have a great variety of skin and hair colours, some that we would easily recognize on Earth. Their ship is one of a fleet, all of this same structure, that have come into the Confederation from Orion, and are currently stationed around or near Earth. While I received this visual greeting, Bareld received a verbal message and vision of a particular crystal known as the Light of Salmura. The Salmat people now transmit this vision/energy of the Crystal of Remembrance, the Light of Salmura, for humanity on Earth, to know, and utilize as they have done – a focused energy of remembrance of Love, of the origin of our beings and their infinite home as Love – beyond the influence of the ‘veil’. 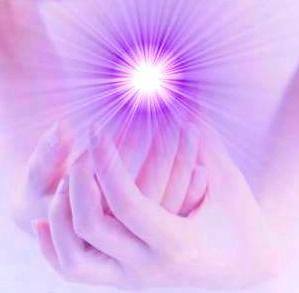 Feel it like the Heart Star of your energetic body, the pure white light of Source within you, your core, connected to the network of Light and the White Flame of the divine feminine. 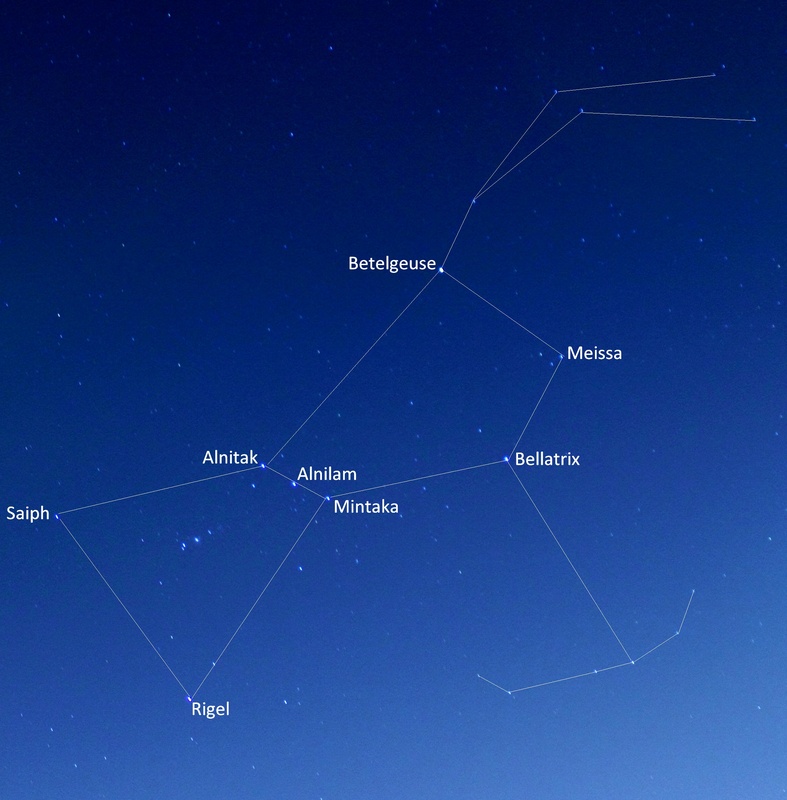 Orion is a big constellation; some regions of it are still influenced in terms of reptilian control, but planets and civilizations around Betelgeuse, Meissa and Bellatrix are stabilized in higher frequencies, and members of the Intergalactic Confederation. Two tiny ships fly in above the moon, August 30th. In this close-up of the craft at the centre top of the frame, you can see the Orion delegate in blue clothing seated behind a white curve at the front of the ship, red underneath, and a translucent violet dome over the top. The white curve is a reflection in miniature of the big curves I saw in inner vision around the front of the large Orion ships. (Later, I would come to know this representative from Orion as Tanabor, a Melchizedek of Meissa, who has become a close, supportive and very dear soul companion of my Twin Flame Ashura&I during Earth’s planetary ascension.) Here’s another photo, taken on September 8th, which is a beautiful multi-layered representation of, through one view, a clearly-detailed small ship, and through another view, of three people seated at a round table with a large object in the centre of it, and a fourth person approaching the table from the upper left. These loving people gave me a visualization using the Light of Salmura, the Crystal of Remembrance, for Syria. Of course, this can be used anywhere around the planet, but for the major ‘convergence’ of energies during September 2015 and for the Lighting of the Middle East, where so much energy of old is being unlocked/rebirthed in its higher vibrations, if it resonates for you, please use this visualization. Calm your mind and centre your focus in your Heart, with pure love. Cleanse yourself with the Violet Flame, and envision the Crystal of Remembrance shining with its white light of Source in your Heart centre. Connect with the core of Gaia and the higher heart grid. 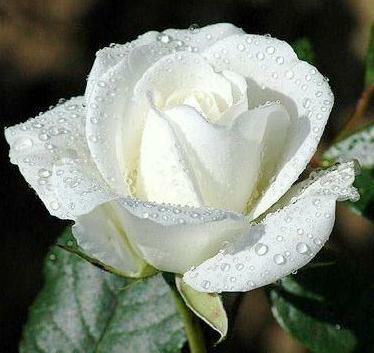 Now see a White Rose encompassing Damascus, the capital of Syria, with its petals of light unfolding, a Rose of Peace. Envision the Crystal of Remembrance nesting inside the heart of the Rose, and that high Light spreading through the Rose. Seat the Rose on a Fruit of Life (see below). The Fruit of Life extends outward, covering all of Syria, then the Middle East, and imprinted through the whole Heart grid of the planet, flowing with this Light of Salmura. Feel in your own heart, within your being, connected to all beings, Peace, Love and Life coming to Fruition in this Now…. *If you find all the above too much to visualize, just relax in love and hold the intention. Fruit of Life, comprising 13 Spheres. Feel the flow of Source through the Thirteenth Gate, the Divine Feminine’s doorway in the heart of the Fruit of Life. Like the Gates of the Sun and Moon, and all stars, we become convergence points of higher dimensions of light, love, and life. It is as simple and natural as breathing. Breathing love into our heart and out to All, as one circular sharing flow, connects us instantly with all that is of light, love and life – our star families, our human brothers and sisters on Earth, people of the inner Earth, elements and elemental beings, the dear animals and plants, crystals and sacred sites of the planet, the ground we walk upon in this moment, the atoms, strands and cells in our bodies, planets and stars, it is all Life, beloved of Source. A word about Syria; the Rose of Damascus (from which the Damask Rose varieties were cultivated in many colours) was in ancient origin a white rose. The Arabic name for Damascus is ash-Shām, which means ‘Levant’. Levant, from Latin, means ‘rising’, in the context of Damascus, the rising of the Sun in the east. May the Light of the true Sun rise there now. ‘Ash’ relates vibrationally both to the Tree of Life, to universal Truth, and to the sound ‘akh’ (hieroglyph for the Ibis in ancient Egypt), meaning that which magically effects, and Shām relates to ‘shem’ in the leonine Arua language, meaning divine Light, Light of Source – as in the ship name, Shem Arua, and Samaria/Samarias/Samaritans, Sumeria etc. It is an ancient Light reawakening in ash-Shām this month. Peace, love and joy to the people of Syria, and all on Earth. With thanks and love to my Twin Flame, Ashura, to Bareld, the people of Orion and all star family of Love, and to all reading these words, blessings through the month of September.